Growing up can be tough. 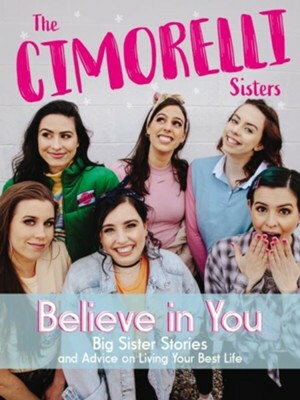 In Believe in Your, the six Cimorelli sisters walk readers through many of the challenges young girls face growing up in the modern world. Christina, Katherine, Lisa, Amy, Lauren, and Dani share their six unique, very different personalities and experiences. Through thousands of messages on social media, hundreds of letters pouring into their fan-mail PO box, and teary-eyed encounters at their meet-and-greets, the sisters have been given a uniquely personal glimpse into the hearts of young girls all over the world. Believe in You addresses those concerns, including navigating dating, growing in faith, having the strongest friendships, dealing with family, and more! Recommended for ages 11 to 14 years. As Christina, Katherine, Lisa, Amy, Lauren and Dani tour the world with their music and read their social media messages, they meet and hear from thousands of girls sharing their hearts. Now, in Believe in You, the sisters are connecting with young women who have the same concerns. I'm the author/artist and I want to review Believe in You: Big Sister Stories and Advice on Living Your Best Life.